In most situations, an age gap of 75 years might just cause a communication issue. In fact, a seven year old might be speaking a totally different language than one who is into her eighth decade. Luckily, barrel racing is a universal language, allowing generations to understand one another, have something in common, and a passion that lasts a lifetime. For Bruce, her love of her horses began almost before she could walk. Because her mother suffered from blood clots and was restricted in what she could do, Bruce’s father took his young daughter with him out to work the family’s Kansas farm. “I rode on the back of Daddy’s workhorse,” recalls Bruce, noting she has photos of her at age two, riding with a firm grip on the hames of the horse’s harness. Bruce’s family also had a pony that the young cowgirl rode every time she could get him cornered up in a stall in the barn in order to mount up. While Bruce began competing at age five, it wasn’t until she married that her competitive career took off. Bruce’s husband put her on one of his ranch horses and gave her a crash course in the fairly new event of barrel racing. She won both days of the Fourth of July event. The Girls Rodeo Association (GRA), as the WPRA was known then, was just getting a toe hold in the Texas Panhandle with approved events near Bruce’s home. 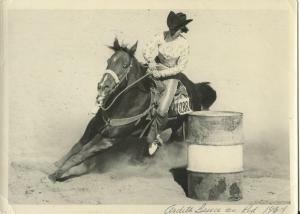 She joined the new Association, competing in Texas and Eastern New Mexico until she moved to Colorado in January 1952. Likewise, Kelsey Kennedy started in the saddle very early, under the age of two. Born into a family of barrel racers and raised in Florida, Kennedy’s mom Machelle was a competitive barrel racer until her own career took a backseat to that of her three daughters, Kamryn (13), Kendall (12) and Kelsey. Kennedy and all three of her sisters have joined the ranks of the WPRA but they compete in the Association’s Junior Division, founded in 2007. As members of the Southeastern Circuit, the sisters not only compete in co-approved jackpot events but also in the various pro rodeos which offer junior barrel racing. Kennedy enjoys that her family travels and competes together, adding that her dad, Kirk, comes along as much as possible too. Her goal is to qualify for the Southeastern Circuit’s Junior Finals. “I would like to go to the NFR as much as I can,” she adds of her future plans. The second grader at Glades Day School wants to be a dentist (“this week,” mom Machelle says.) when she grows up. While Kennedy is just learning the ropes of the rodeo trail, Bruce remembers when kids competed right alongside the adults at pro rodeos, before the age limit was passed in the 1990’s. Bruce believes it is easier today to start a career in barrel racing thanks to the proliferation of schools to teach riding techniques and standardized rules to follow. When asked if she had advice for Kennedy and other young cowgirls, she laughs. “Probably more for her parents than for her,” she says. “It’s a lot of fun to go and to win but it shouldn’t be entirely about winning, especially as a child. With over six decades experience in the arena, Ardith Bruce has seen plenty of changes to the sport. Things that modern cowgirls, including Kennedy, would likely take for granted were not standardized when Bruce first began her career. “The first was the pattern,” says Bruce. “You didn’t even know what the pattern would be, a committeeman would set it and we were expected to follow.” Bruce says they might be expected to take the third barrel first; it was up to the committee people at each event. Patterns were not staked in those days either. In fact, the barrels were usually just stepped off. Another innovation was the introduction of electronic timers, a requirement in today’s rodeo. When Bruce started, stopwatches were not even standard. Most of the time, the judge simply stood at the line and timed using a wristwatch or pocket watch. “They’d be out there with their pocket watch and they’d have to do math to figure your time; you were just never real sure about the times,” she notes. Her husband, a gunner’s mate in the Navy during the war, had a real stopwatch that he used to time his crew in the service. He brought it along to the rodeos for the judges or secretaries to use to time the events. Bruce said they continued to make improvements to the original model, eventually dropping the heavy car batteries to make the timers more portable. While she lists other improvements such as ground conditions, the addition of added money, increased stopping distance, and overall attitude toward the barrel racers, Bruce also mentions a few changes that she doesn’t like as well. “We thoroughly enjoyed it and made great friends,” she says of the camaraderie built during her years on the road. Of course, all cowgirls have their favorite venues and their favorite horses. For Kelsey Kennedy, she likes the Lakeland, Fla., rodeo and her “most favorite” is Jacksonville, Fla.
“That’s where they have the Shamrock Showdown,” says Kennedy. The cowgirl was recently featured on the cover of the Barrel Horse News for a big win at that very event. Bruce’s favorites list is long but Colorado Springs is at the top of the list. As for horses, Straws Kingwood Snip, aka Red, is at the top for Bruce, though she has had many winners over the years. With four horses still in her barn, Bruce hopes to continue to compete despite her age and some health issues. Kennedy has her dream horse in Billie Bob, a 25 year old, 12h, 400 pound grey pony who came to the Kennedy family five years ago and passed down through the older sisters to Kelsey. The young cowgirl is already learning the value of good care for her horses too. Saying that she keeps Billie Bob’s stall clean and fresh water in front of him, Kennedy also offers the horse hay at lunchtime and fresh shavings to roll in. Ardith Bruce was also impressed. After 60 years of membership in the country’s oldest women’s sports association, Bruce has a healthy respect and passion for the organization that she helped shaped in its earliest years and has donated countless hours to the Association’s nearly 70 year history. Bruce says she always felt a debt of gratitude to the Association for giving her the platform on which to build her career. “I always felt it was important to give back, whether trying to help secure new venues for events or working to improve conditions.